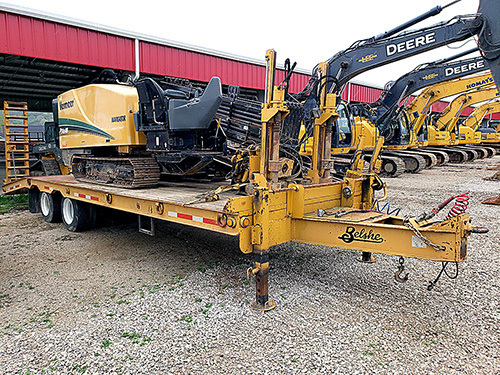 • 2014 John Deere 245G LC Excavator, s/n 1FF245GXKEE600358, Enclosed Cab, AC, Dromone Quick Coupler, 24” Tooth Bucket, 31 1/2” Wide Tracks, 2,484 hrs. 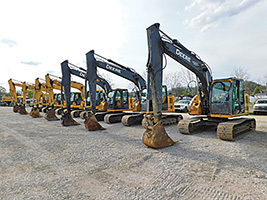 • 2014 John Deere 245G LC Excavator, s/n 1FF245GXJEE600362, Enclosed Cab, AC, Dromone Quick Coupler, 30” Tooth Bucket, 31 1/2” Wide Tracks, 3,325 hrs. 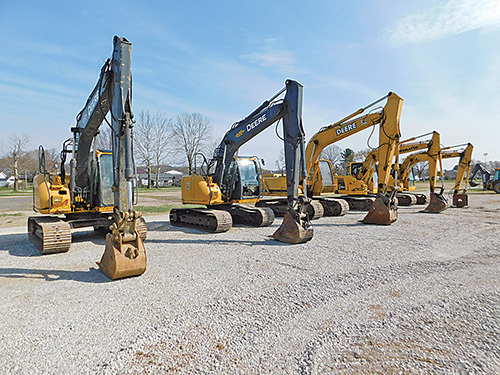 • 2012 Komatsu PC228USLC-8 Excavator, s/n KMTPC 226A02050764, Enclosed Cab, A/C, 24” Tooth Bucket, 31 1/2” Wide Tracks, 6,495 hrs. • 2010 Komatsu PC228USLC-8 Excavator, s/n 6E02050011, Enclosed Cab, A/C, 24” Tooth Bucket, 31 1/2” Wide Tracks, 9,114 hrs. 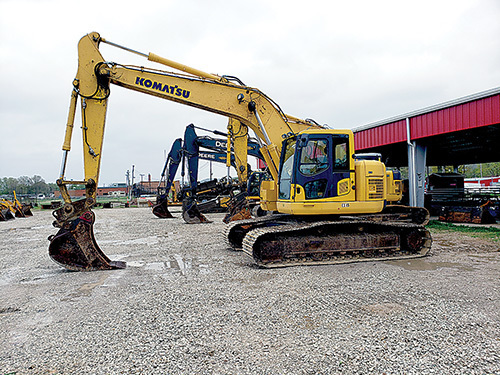 • 2007 Komatsu PC228USLC-3EO Excavator, s/n KMTPC161J02040708, Enclosed Cab, A/C, 31 1/2” Wide Tracks, 24” Tooth Bucket, 9, 968 hrs. 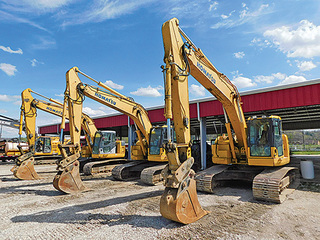 • 2010 Komatsu PC138USLC-8 Excavator, s/n KMTPC189C01024888, Enclosed Cab, A/C, 23 1/2” Wide Tracks, 24” Tooth bucket, 8,267 hrs. 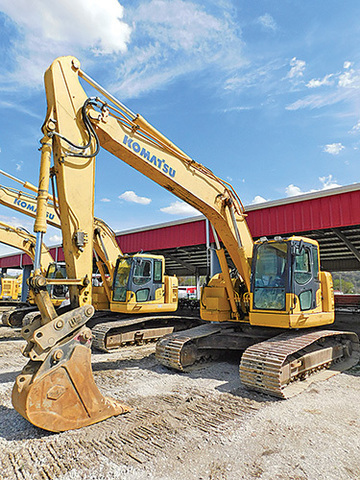 • 2010 Komatsu PC138USLC-8 Excavator, s/n KMTPC189C01024835, Enclosed Cab, A/C, 23 1/2” Wide Tracks, 24” Tooth Bucket, 7, 923 hrs. 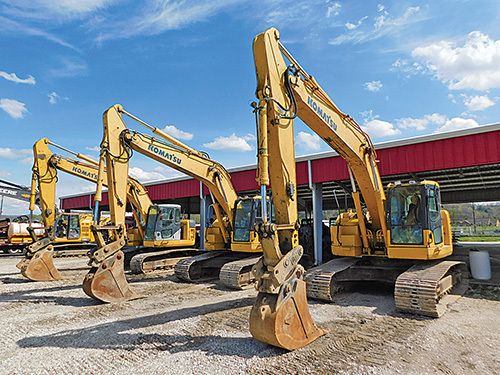 • 2010 Komatsu PC138USLC-8 Excavator, s/n KMTPC189V01024777, Enclosed Cab, A/C, 23 1/2” Wide Tracks, 24” Tooth Bucket, 9,695 hrs. • 2013 John Deere 135D Excavator s/n 1FF135DXCCD303348, Enclosed Cab, A/C, 24” Tooth Bucket, 23 1/2” Wide Tracks, 4,767 hrs. 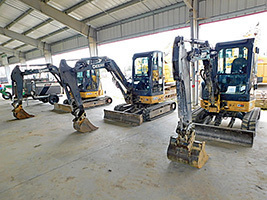 • 2010 John Deere 135D Excavator, s/n 1FF135DXAA0302215, Enclosed Cab, A/C, 23 1/2” Wide Tracks, 24” Tooth Bucket, 9,123 hrs. 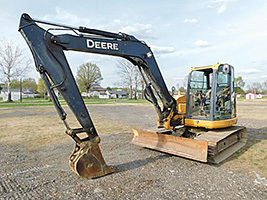 • 2010 John Deere 135D Excavator, s/n 1FF135DXAA0302245, Enclosed Cab, A/C, 23 1/2” Wide Tracks, 24” Tooth Bucket, 9,445 hrs. 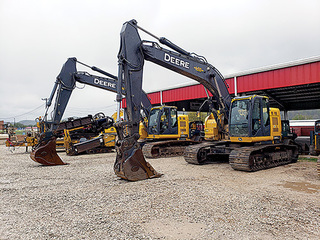 • 2011 John Deere 85D Excavator, s/n 1FF085DXABG016421, Enclosed Cab, A/C, 8’ Blade, 18” Tooth Bucket, 23 1/2” Wide Tracks, 6,345 hrs. 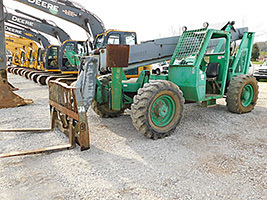 • 2003 John Deere 160 LC Excavator, s/n P00160X042044, Enclosed Cab, 24” Tooth Bucket, 23 1/2” Wide Tracks, 9,768 hrs. 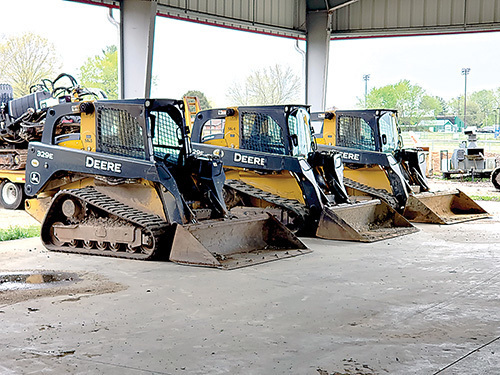 • 2011 John Deere 35D Mini Excavator, s/n 1FF035DXLBG267505, Enclosed Cab, A/C, 5’9” Blade, 24” Tooth Bucket, 11” Wide Rubber Tracks, 4,571 hrs. 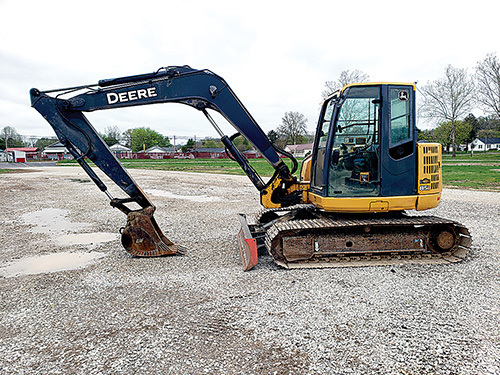 • 2011 John Deere 35D Mini Excavator, s/n 1FF035DXLBG267469, Enclosed Cab, A/C, 5’9” Blade, 18” Tooth Bucket, 11” Wide Rubber Tracks, 4,697 hrs. 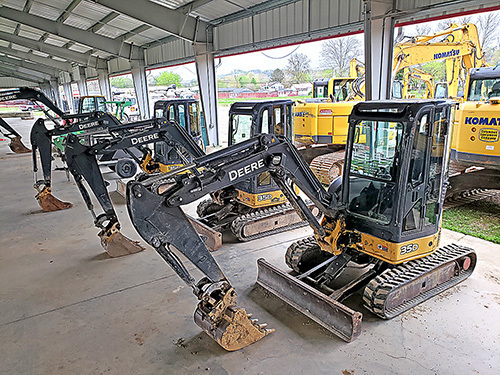 • 2011 John Deere 35D Mini Excavator, s/n 1FF035DXCBG267038, Enclosed Cab, A/C, 5’9” Blade, 18” Tooth Bucket, 11” Wide Rubber Tracks, 5,403 hrs. • 2014 John Deere 329E Skid Steer, s/n 1T0329EJEEE257532, Rubber Tracks, Aux. 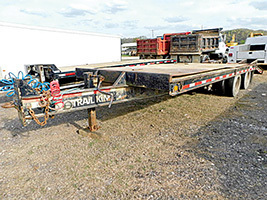 Hydraulics, 1-Speed, Enclosed Cab, A/C, 7’ Smooth Bucket, 2,275 hrs. 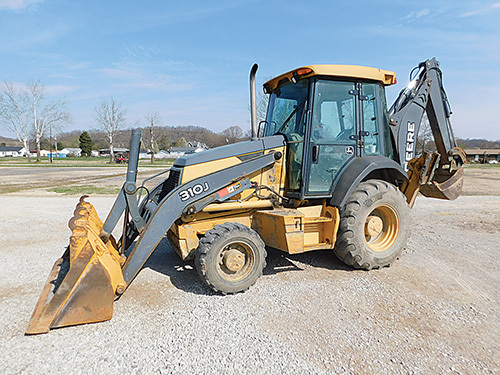 • 2013 John Deere 329E Skid Steer, s/n 1T0329EJVDE252551, Rubber Tracks, Aux. 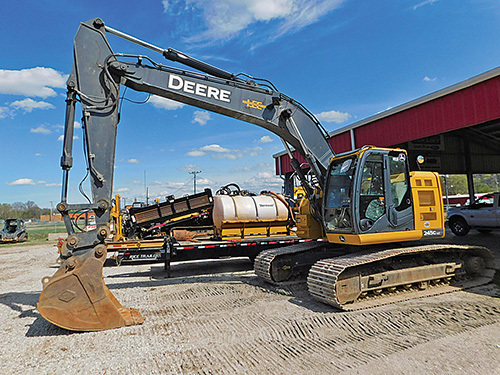 Hydraulics, Enclosed Cab, A/C, 7’ Smooth Bucket, 2,900 hrs. • 2013 John Deere 329E Skid Steer, s/n 1T0329EKEDE249793, Rubber Tracks, Aux. 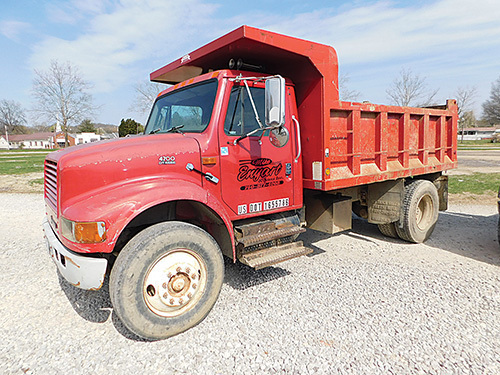 Hydraulics, 2-Speed, Enclosed Cab, A/C, 7’ Smooth Bucket, 2,802 hrs. • 2013 John Deere 329E Skid Steer, s/n 1T0329EKLDE249757, Rubber Tracks, Aux. 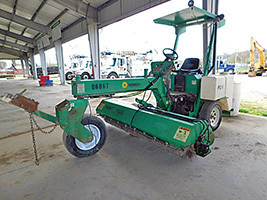 Hydraulics, 2-Speed, Enclosed Cab, A/C, 7’ Smooth Bucket, 2,530 hrs. • 2013 John Deere 323D Skid Steer, s/n 1T0323DKFDG245976, Rubber Tracks, Aux. 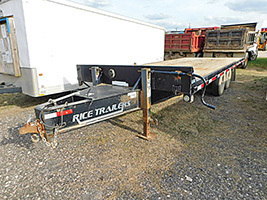 Hydraulics, 2-Speed, Enclosed Cab, A/C, 6’ Smooth Bucket, 1,824 hrs. 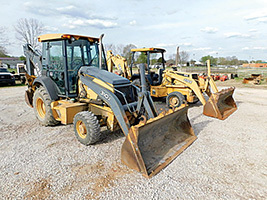 • 1999 John Deere 310E Backhoe, s/n T0310EX872775, 4 WD, Canopy, 18” Tooth Backhoe Bucket, 7’6” Smooth Loader Bucket, 2,981 hrs. 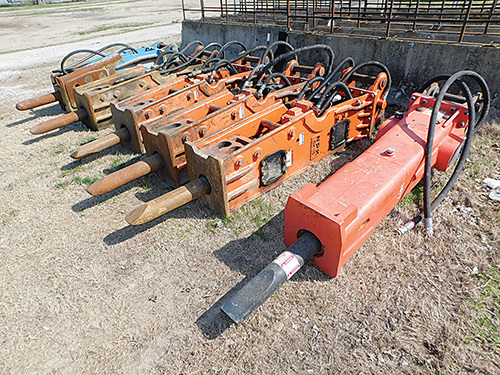 • 1998 Terex SS1048 Turbo Telehander s/n 981170, 10,000 lb. 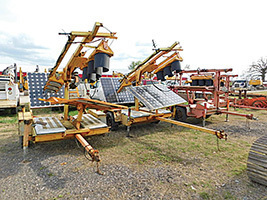 Capacity, Front Outriggers, 3,842 hours, Machine Weight: 27,300 lb. • 2012 Vermeer Navigator D24X40 Series II Directional Drill, s/n 1VRZ19038C1001530, Digi Trak MFD Multi-Function Remote Display, 2,950 hrs. 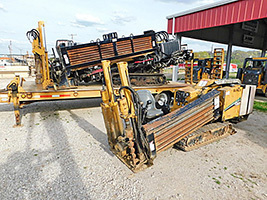 • 2007 Vermeer Navigator D7X11 Series II Directional Drill, s/n 1VRZ130Z571000715, 3,092 hrs. • Finn T120 Hydro Seeder, s/n 2136, Diesel Engine, 1,000 Gal. Tank, 4,483 hrs. • Lincoln Commander 3000 Diesel Powered Portable Welder, s/n 1011008231, Mounted on Trailer, 4,434 hrs. 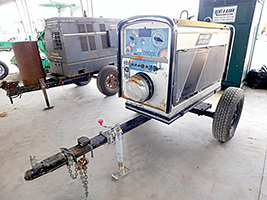 • Red-D-Arc Model D500K 5+3 Diesel Powered Portable Welder, s/n C1980500322, Mounted on Trailer, 2,297 hrs. Everything is selling on an “As is, In Place Basis with NO Warranties or Guarantees of any kind. It is the buyer’s responsibility to inspect before bidding; Everything must be paid for in full day of auction with: Cash, Certified Check, Visa, MC, Discover, Wire Transfer, or Company Check with a Bank Letter of Guarantee. Onsite Buyer’s Premium is 10%. Online Buyer’s premium is 13%. A 3% convenience fee will be applied to all credit card purchases. 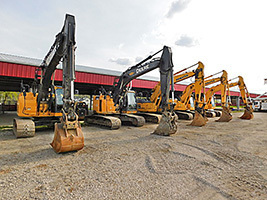 All other terms of on-site buyers apply to online bidders. Removal is the Buyers Responsibility, Expense and Risk. 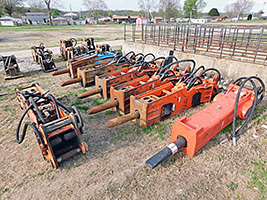 Load-out is available on auction day following the sale, and from 9 a.m. to 5 p.m. on Thursday May 9 to Saturday May 11, and Monday May 13th to Friday May 17th. 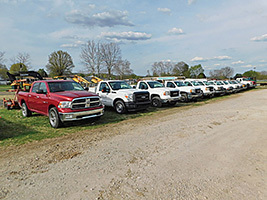 From Proctorville, go South on County Road 107 (State Street) 1.4 miles to auction site at the Lawrence County Fairgrounds. Watch for Signs!! !